The 4th Annual Club Tribe Masters Classic was held on March 23 in Williamsburg. It was a fun meet as always and, with 129 swimmers, this year was the biggest event yet! The music, the college swim team volunteers, and the 100-yd relays all contributed to a festive atmosphere. Craig Bauer (left) receives the 2019 LMSC Volunteer Award from Kirk Clear. The results have been uploaded to our website and to the USMS results database. There were seven new LMSC records set at the meet: Ann Lyttle and Greg Harris each set two, while Gabrielle Mizerak, Katie Grier, and Lauren Hasselquist had one apiece. As has become the custom at this meet, the Virginia LMSC Volunteer Service Award was presented. LMSC Chair Kirk Clear presented the award to this years recipient, Craig Bauer. 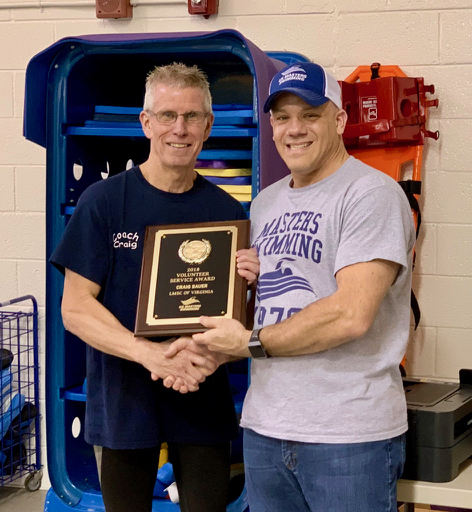 Craig is the coach of the Northern Neck Stripers Swim Team and was nominated by his devoted swimmers, who cited his passion for the sport and his dedication to the core values of USMS. The enthusiasm of his swimmers testifies to the success Craig has had in inspiring their interest in masters swimming. Congratulations, Craig, on a well deserved honor! And thanks to all the volunteers who helped make this meet happen, in particular to meet director Kyle Ahlgren.